This photo shows the inside of the VE Commodore rear muffler and the direction the exhaust gas must take to exit the muffler.. The gas is forced to travel through the louvred tube, through small restrictive chambers, and it has to go back and forth 3 times before the exhaust gas can exit the rear muffler. All other Gen 3 Variants have a dual 2¼" exhaust system. The Crewman and the 1 Tonner have a single 2¼" restrictive exhaust. Have a look inside the mufflers. The rear muffler is very restrictive. The gas has to travel back and forth before it can escape. Holden have changed there VY2 Exhaust systems dramatically. They are now using GM Daewoo Catalytic Converters which sit up near the power steering rack instead of underneath. The Oxygen Sensors have also been moved forward, presumably to overcome the problems with O2 Sensor failures. 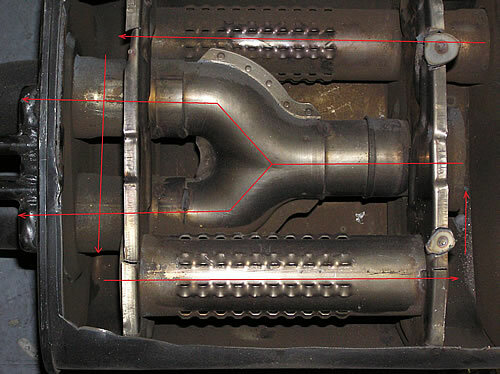 The GM Daewoo Catalytic Converter is trapezium shaped - "Wierd As". As it is shaped like a fat brick it cannot be positioned underneath the car. The wires for the Oxygen Sensor are also too short. Extractors are too long to put the cats back in there original position as the oxygen sensor wires are too short to reach the earlier position of the VT-VX. We recommend fitting the short 4 into 1 extractors as well as fitting new catalytic converters. That way the Oxygen Sensor reads off all 4 pipes and is close to the motor to avoid error codes. The large body Hi-Flo cats have a thinner profile so you don't lose ground clearance and give a better flow. Holden have increased the size of the Cats and pipework on the new VY's, but to compensate, the "Factory" Squash Marks are even bigger. You can see the pipes behind the cats have been squashed to half the thickness and so has the system. The pictures featured here show the poor quality exhaust systems that are fitted to V8 commodores from VT onwards standard from Holden. Note the "flat spot" that hinder exhaust flow and restrict power. These three pictures are from a 2001 VX R8 HSV Commodore. The next two pictures show the engine pipe and pipe at the rear of the catalytic converter on an SS Commodore. (Executive, Berlina and Calais are the same). Note the inner pipe the exhaust gas travels through.